The former Equity Building, Station Square is a development of 67 contemporary 1 and 2 bedroomed apartments adjacent to Colchester’s main train station and just outside the vibrant city. These stylish apartments have two carefully planned communal areas, both of which Europlanters are proud to have been involved in. The central courtyard on the 1st floor consists of a communal seating area using Europlanters floating benches on planters and 20 additional planters. By attaching the planters together, the planters create a large planting bed forming an attractive secluded garden and tranquil setting out of the hustle and bustle of the city. 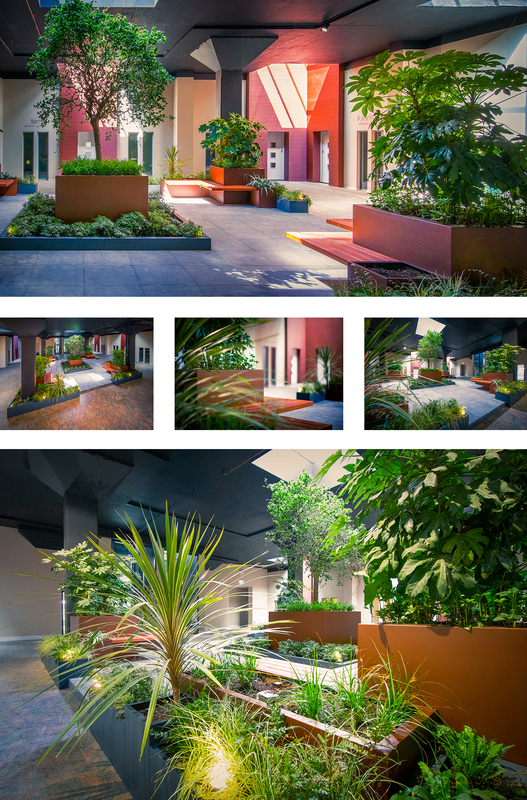 The planters were all sprayed in a RAL 7016 Matt, to compliment the building’s exterior. The indoor garden and lower courtyard was designed to incorporate a unique open rooflight creating an open-air atrium big enough to allow a large tree to take advantage of the elements. Around this centrepiece seating and 46 additional planters in a dark copper finish compliment the rich interior décor.